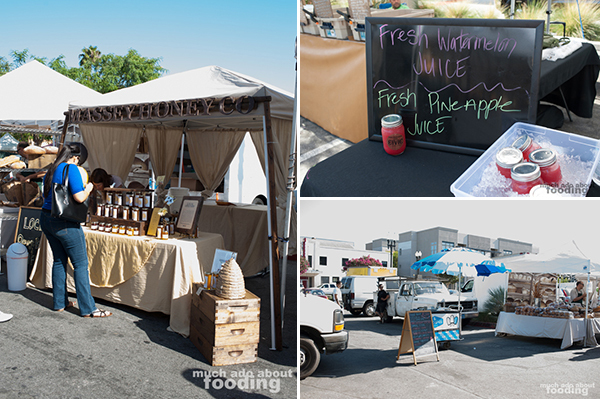 This post is part of a series Much Ado About Fooding is doing on farmers' markets - Duc and I plan to visit as many as we can, starting in southern California, to get a sense of what sets each apart, what drives communities to them, and what gems people should look out for. 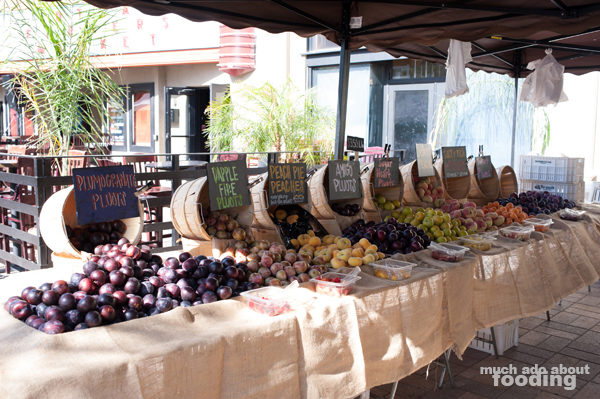 To keep track, bookmark the "Farmers' Market" category. 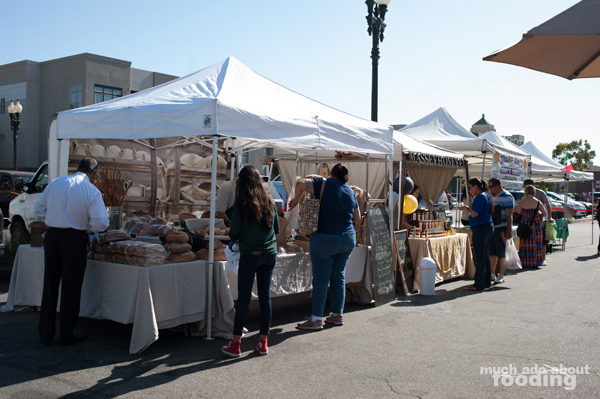 Social media has become such a strong part of our lives so when a farmers' market takes to the networks to announce its return, there is no doubt of success whether niche or not. Downtown Santa Ana, also known as DTSA, seemed to be well-connected to every other food-loving person I knew online so once word got out that a farmers' market was cropping up again, word really got out. 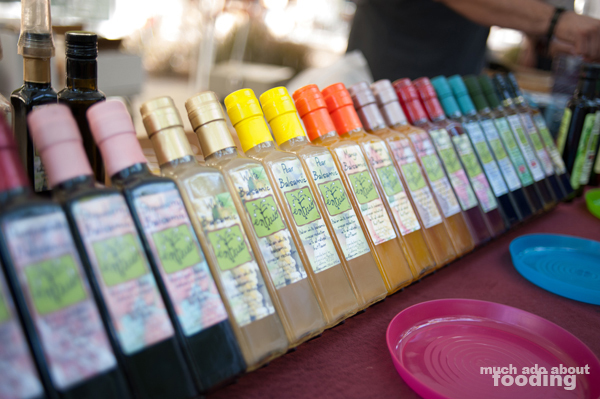 The DTSA Farmers' Market is not only in the heart of the burgeoning hip food scene of Santa Ana (located in Spurgeon Promenade) but it is the home of several artisan food makers and produce-slingers that have already built a name for themselves outside of the market. Perhaps that's why I've been hearing so much about it - everyone else involved is tweeting/Facebook/Instagramming about it too. I finally had a free Thursday one day and ventured my way through DTSA to see what there was to rave about. I truly meant not to spend money upon my visit. I carried no cash on me in hopes that it would stymie any temptations but the enticements were everywhere. If you are coming from 3rd Street, you would enter through the side shoot from the market which has many prepared foods and familiar faces. 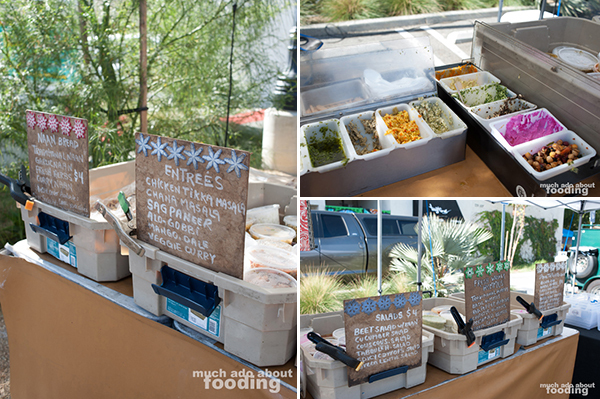 I immediately recognized BREAD Artisan Bakery and Da-Le-Ranch set up with the bare victuals we need of bread and meat. Massey Honey was present too as were Front Porch Pops, two local small businesses I've seen here and there. I fell for the fresh watermelon and pineapple juice mason jars which went for 2 for $9 or $5 a pop. I was ultimately unable to stay away from spending money at India Express which was just the start of the samples train at the DTSA Farmers' Market. Everyone in the vicinity was roped into tasting various hummus types on fluffy bites of fresh naan. I walked away with a large paper bag in the crook of my arm, laden with the spices of southeast Asia. 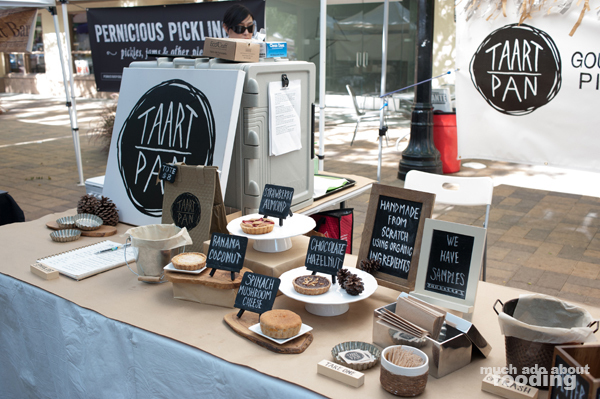 The Pernicious Pickling Co. was present, a local start-up business just begun in late 2013 which prepares everything out of the beloved Hood Kitchen; I tried several of their items and quite enjoyed them! 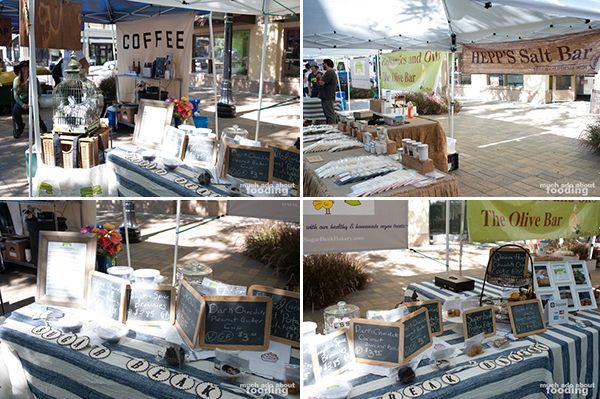 Coffee, salts, roasted peanuts, and baked goods took up one end of the market, and everyone genuinely seemed to get along. You could find a lot of good treats for others in this section. You could also, perhaps, find yourself a treat too such as an individual-sized tart. 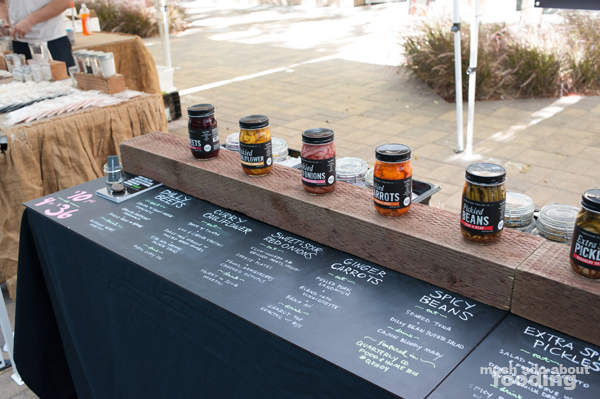 Even with all of the artisan products, the market still managed to provide some produce. 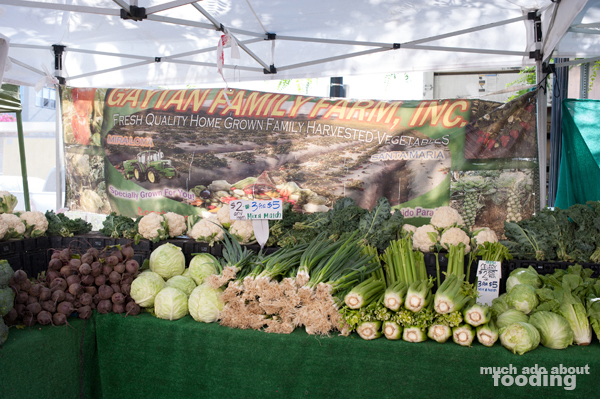 The selection was small and seemed primarily to come from Gaytan Farms but the space of the farmers' market was not the largest either. Most visitors looking for groceries ended up milling inside the booth of Gaytan with some venturing to the pluot people across the way. With more pluots and apriums and other hybridized fruits than I could expect there being in one place, the fruit booth had something for every tastebud. 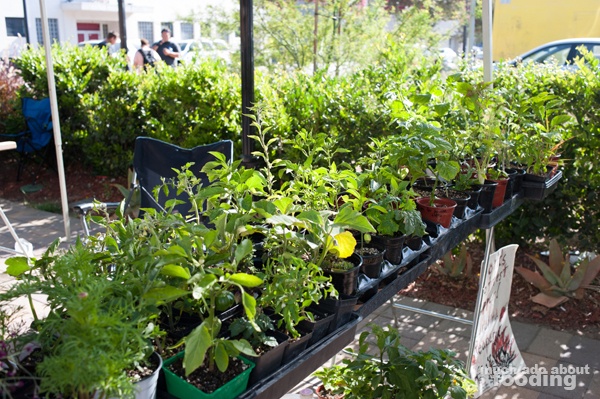 If you aren't interested in buying your groceries in full-form, you could also get a starter plant or herb from Rob at his plant stand and thereby grow your own herbs and vegetables. 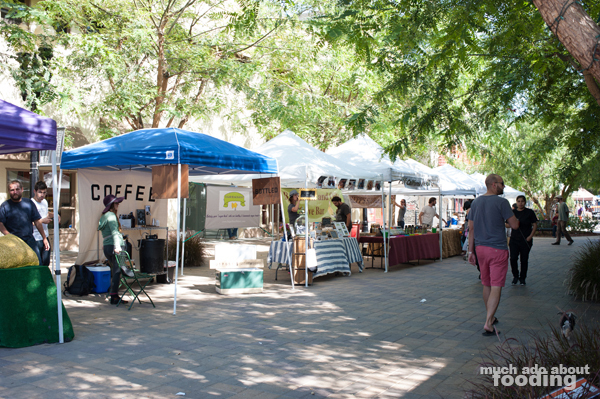 I do believe that the DTSA Farmers' Market is small but it will pick up quickly. Currently just one row with a few sections with booths on either side, the market can be visited in under an hour's time depending on how chatty you are with the vendors. It is a positive step in the right direction for food and caring about sourcing. 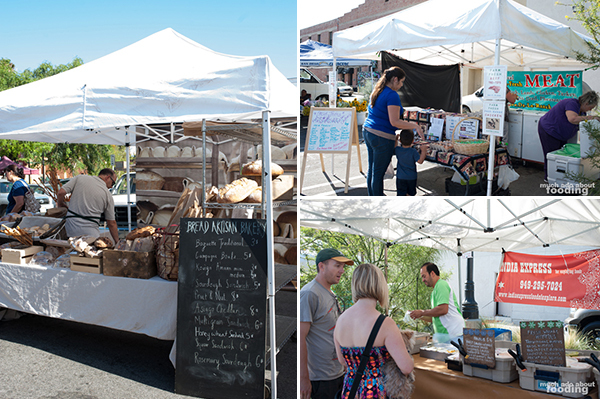 If you want to find the market, it is open Thursdays from 2pm-8pm with summer hours being 4pm-8pm. Photography by Minerva Thai. More photos available on Facebook here.